Just last month I kicked the tires on the Bing Code Search tool and found it to be a solid way to access code samples from MSDN, StackOverflow, Dotnetperls and CSharp411. Now here we are just a few short weeks later and I am downloading a significant makeover of that tool appropriately renamed the Bing Developer Assistant. 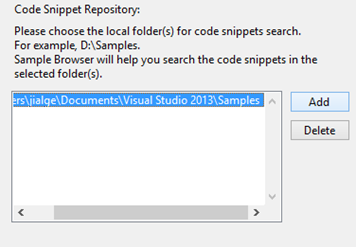 With marked improvements in IntelliSense support and a new one stop location for code snippets and samples, it definitely improves on the original. For me the best new feature is the inclusion of Offline search, this provides the ability to define local directories that contain your own sample code, enabling disconnected search capabilities. Conceptually I am hoping offline search would help the onboarding process for new developers in my team, I find they tend to reinvent the wheel (sometimes unnecessarily). These Offline search capabilities could be further refined by allowing users to explicitly force disconnected searches or by giving priority to local code snippets in the search results. Download links are here, check it out!